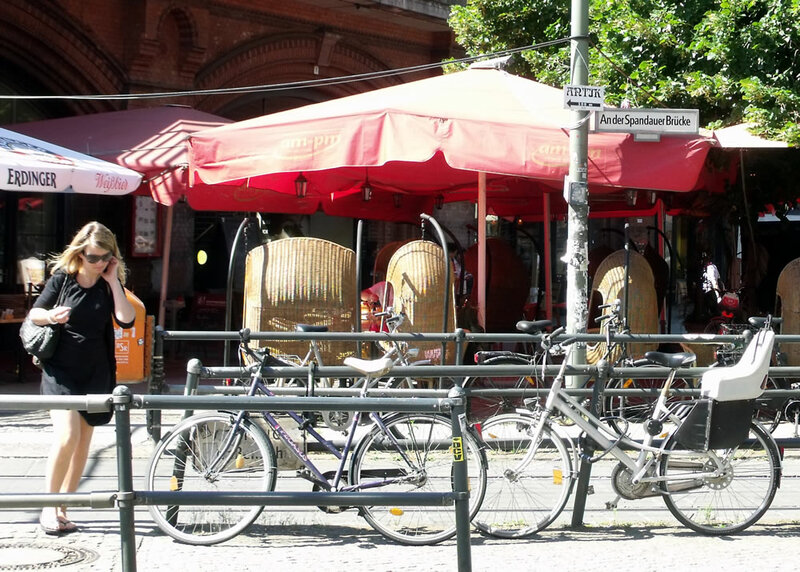 One of the many things that makes Berlin so enticing is that it is made up of so many areas with their own distinctive atmosphere and culture. A case in point is the area around Hackescher Markt, with its distinctive S-Bahnhof, eclectic market, eateries and bars, exotic night-life, cinemas, shops, and Jewish history. The area gets its name from a Prussian General and Commandant of Berlin, Hans Christoph Friedrich Graf von Hacke. He was given the job in the late 1740's, by King Friedrich II, to lay out a market square and residences in what was then swampy marshland outside the city wall. Friedrich II was in the process at the time of having the old city fortifications torn down, and a new wall - for collecting duty on goods entering Berlin rather than defence - built further out from the centre (and you thought there was only the one Berlin Wall, which fell in 1989, didn't you?). Hackescher Markt Station with the Fernsehturm peeping over the top. The buildings on Neues Promenade on the edge of the market square are pretty much original from the time of the establishment of Hackescher Markt, give or take a major rebuild and change of façade. 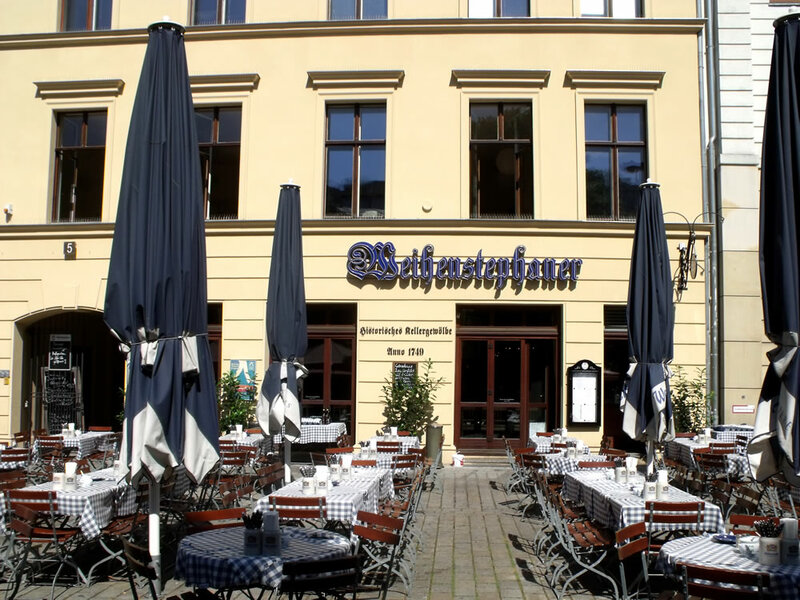 In particular, the Weihenstephaner restaurant/Biergarten/Bierkellar at No.5 advertises itself as having a 'historisches Kellergewölbe' or historical cellar vault from 1749. By the way, the Weihenstephaner is a bit of Bavaria transplanted onto Berlin soil, serving those delicious brews from the Bayerische Staatsbrauerei (Bavarian state brewery) that claims is the oldest brewery in the world, having being founded in 1040. Next door to the Weihenstephaner at No.6 is the former entrance to Aufbau-Verlag, which was founded in 1945 with a remit of publishing Communist and anti-fascistic literature, and became the largest publishing house in the former East Germany (DDR/GDR). It moved out in 2009 but is still very much a respected publisher, albeit now in private ownership rather than a propaganda arm of the SED. The literary tradition of Neues Promenade goes back a long way; for example, the Idealist philosopher Johann Gottlieb Fichte lived out his final years here at No.9/10. 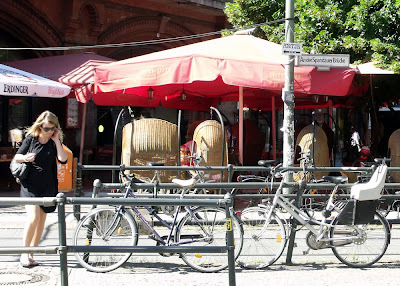 For this reason, an application was made to name the street Fichterstrasse in 1862, but this was turned down. Meanwhile, the house at No.1 was built for the poetess Anna Louisa Karsch in her old age. Her life was marked by poverty, but her poems drew the attention of King Friedrich II, mainly because she praised his campaigns against Silesia (in Poland) to high heaven. Otherwise, the beauty of her poetry brought her to the attention of Enlightenment figures such as Moses Mendelssohn, Herder, Gotthold Ephraim Lessing, and (inevitably) Goethe. The house at No.1 was built for her by Friedrich II's successor, Friedrich Wilhelm II, in 1787 and she lived there until her death in 1791. Called in her own time 'The German Sappho', she is considered the first female German poet to make a living by her writing. There is a memorial to her on the outside wall of the nearby Sophienkirche, with the inscription "Kennst Du, Wandrer, sie nicht / So gehe und lerne sie kennen" ("Do you not know her, wanderer? Then go forth and get to know her"). 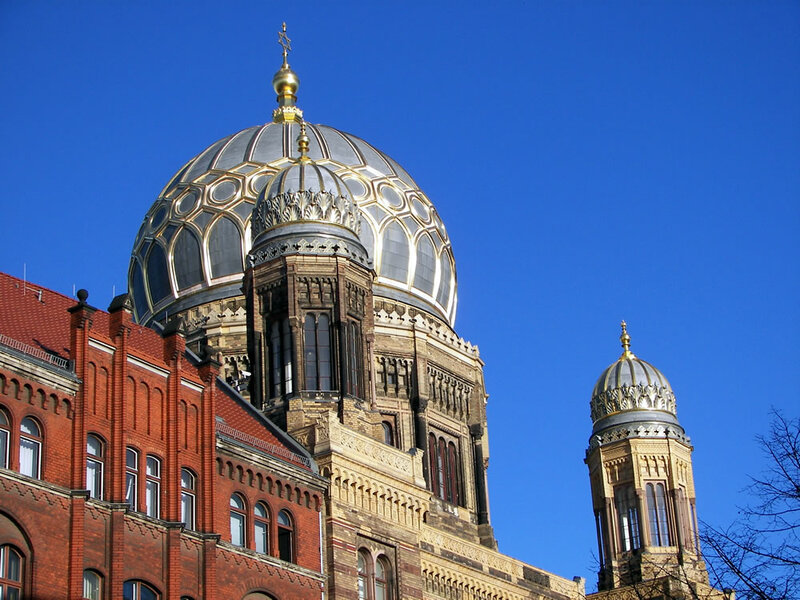 The Sophienkirche where Karsch ended her days was consecrated in 1713, before the creation of Hackescher Markt, and built on land donated to the Protestant congregation by the Jewish community ( the Protestants obviously having a cash-flow problem at the time). The fact is that this swampy area had already been colonised, growing up outside the Spandauer Tor - or Spandau Gate - in the fortifications thrown up to defend what were then the twin cities of Berlin and Cölln. These were enacted by The Great Elector Friedrich Wilhelm of Brandenburg beginning, in 1650, in response the the Thirty Years War (you'll notice all the nobles in the story of Berlin are called either Friedrich, or Wilhelm, or both). 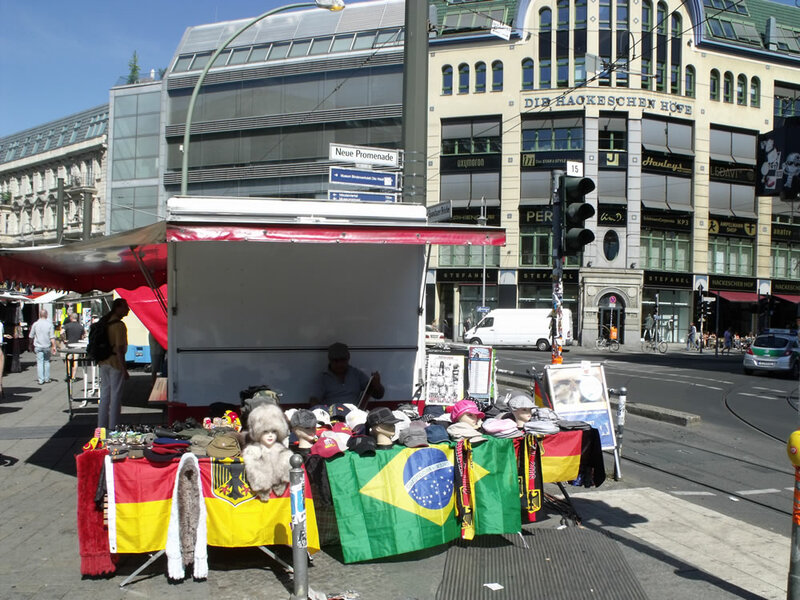 The undefended shanty town was known as the Spandauer Vorstadt, and inevitably it was originally a place for misfits who didn't enjoy the protection of the Berlin garrison, so no surprises that a strong Jewish community was established here. This is because originally there was a moat (Graben) running along here in front of the city walls, from which a cotton twine mill (Zwirnmühle) got its water until the moat was filled in and the S-Bahn line built in 1877. 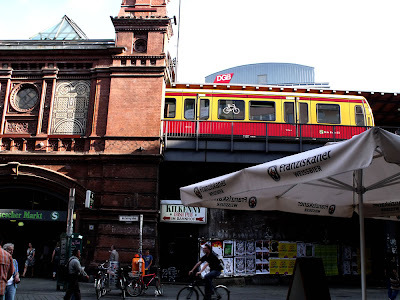 In fact the S-Bahn line from Am Kupfergraben, across to the Museum Island, through Hackescher Markt, Alexanderplatz Bahnhof, and all the way to Jannowitzbrücke Bahnhof follows what was once the city wall and moat. Not that there's anything wrong with selling tat to the tourists: for many years the British Council had a shop and offices here too. 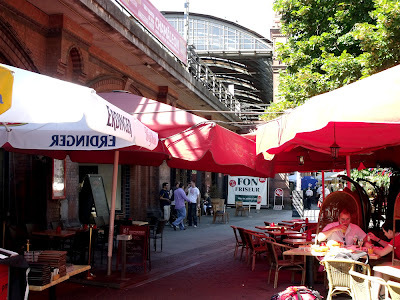 The building in the background above is another good reason to come to Hackescher Markt - it is one of the entrances to die Hackeschen Höfe. These are eight inter-connected courtyards ('Höfe') built in 1908 as an experiment in housing in what had become a densely over-populated Berlin: when originally built there were eighty living apartments with en suite bathrooms, indoor toilets, balconies, and coal-fired central heating. 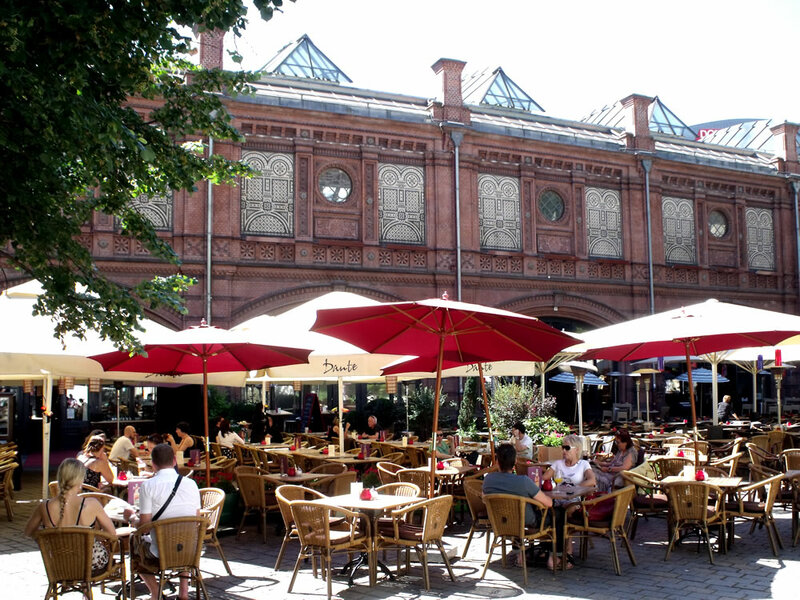 Nowadays, after being restored in 1997, the courtyards contain smart restaurants, boutiques, a cinema, and so forth in airy, light-filled, art nouveau spaces. By way of contrast, you will also find here the Anne Frank Centre Berlin on Rosenthaler Str., and the Museum Blindenwerkstatt Otto Weidt ('museum of the workshop for the blind of Otto Weidt'). Anne Frank I'm sure you are only too well aware about, but perhaps not Otto Weidt. Follow this link to the Otto Weidt page on the Jewish Virtual Library for more information. In German, these brass covered cobblestones are called Stolpersteine - 'stumbling blocks' - and are were originally conceived by artist Gunter Demnig. A translation of the plaque on the far right in the photo is: 'Here lived Uri Aron. Year of birth 1942. Deported 1943 Theresienstadt (concentration camp). Murdered in Auschwitz." 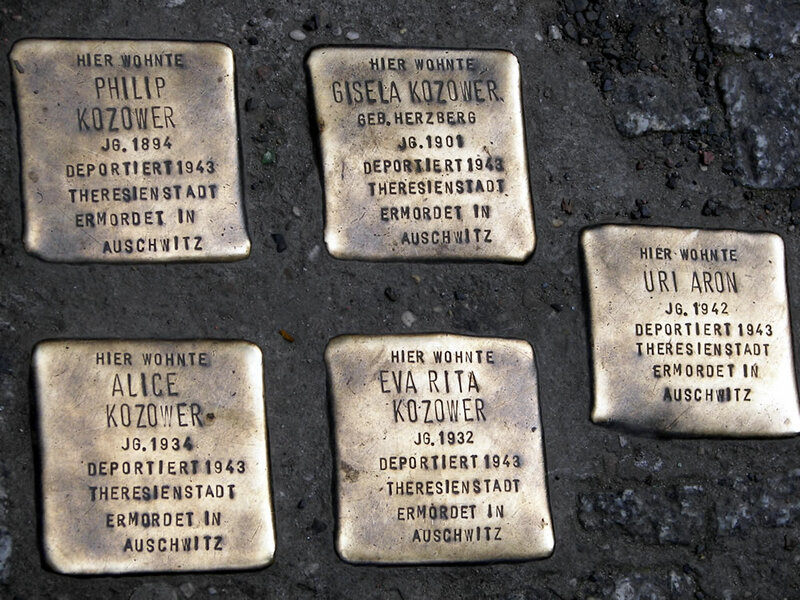 There are around 3,000 of these plaques in Berlin, and many more again in other cities across Germany and other countries where the National Socialists carried out their crimes. On a more positive note, not far from Hackescher Markt, on Oranienburger Straße, is the marvellous Neue Synagogue with its restored Moorish-style golden dome once again gracing the Berlin skyline. 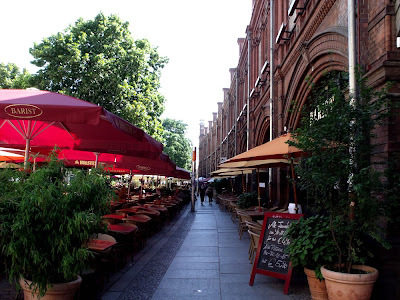 I could go on for another thousand words if I spiralled out from Hackescher Markt into the surrounding area, which is sometimes known as the 'Scheunenviertel'. 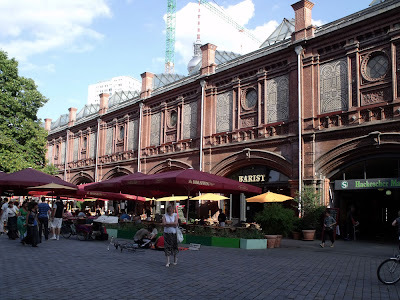 This means 'the barn quarter', because hay for a large cattle market on Alexanderplatz was stored here by order of the Great Elector Friedrich Wilhelm of Brandenburg. He's the person you'll remember had the original city fortifications built, and he ordered the highly inflammable hay to be stored well outside the walls of the (mostly wood-built) city, thank you very much. I'll leave that for another blog, but before I go, just a word or two about the Hackescher Markt S-bahn station. The elevated S-Bahn line here runs along the former city wall and moat, and the station was opened in 1882. It was originally called 'Börse' Station, because the city's stock exchange used to stand nearby. Then, in the DDR times, it was renamed Marx-Engels-Platz station. Only in 1992 did it get its current name after the adjacent Hackescher Markt square. It is one of the best-preserved stations from the original electrified urban light-railway (Bellevue is another good one), with interesting Gothic brick and ceramic work. 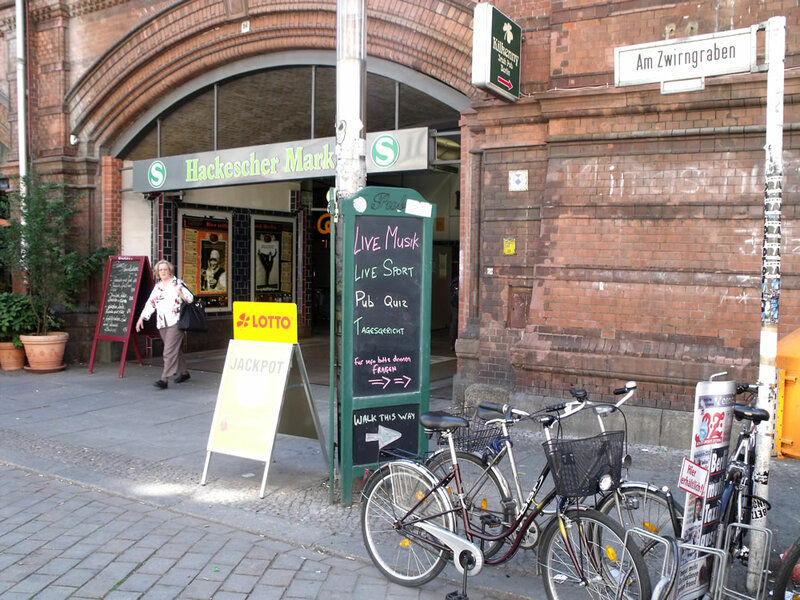 Whether you visit Hackescher Markt for its night-life, day-life, history, or as a launch-pad into the Scheunenviertel, you cannot but agree that it is a unique part of Berlin. Thank you, Graf von Hacke!